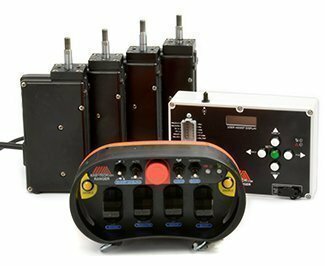 The PACKER series enclosure is designed to comfortably be worn at waist level with our included padded shoulder straps, and is sized for a control surface with room for up to six single-axis paddles or two dual-axis joysticks. The top panel allows for an assortment of toggle switches, pushbutton switches, displays (both color graphical and character-based), dials, E-Stop, etc. The side faces also have room for buttons or keyswitches, as well as a connector used to rapidly charge, or to hook up a backup tether connector to run over a wire if desired. The enclosure is a highly durable polypropylene copolymer, and the electronics are all high-spec SMT: together, these remotes are durable at any temperature – arctic or equatorial. Twenty hours of actively transmitting operating life is a typical minimum with our internal NiMH batteries, with several charging options, but the PACKER can also be run off of our lithium batteries for extended capacity or four AA batteries for easy replacement. The PACKER transmitter is mainly geared towards OEM applications where it’s aggressively priced, but can be found from stock in our RANGER package. For application design help, give us a call any time.